"TOM CRUISE is the boy whom teenage girls want to have. . .
. . .and teenage males want to be"
TOM CRUISE, the exciting star of 'Cocktail' and 'Top Gun,' features in this passionate and action packed story of a small town boy's dream of escaping his dead-end life. His only way out is to use his exceptional talent at American football, and make it as a big time pro. But to get there, he has to fight to win and make all the right moves. Big box re-issue from 1989. 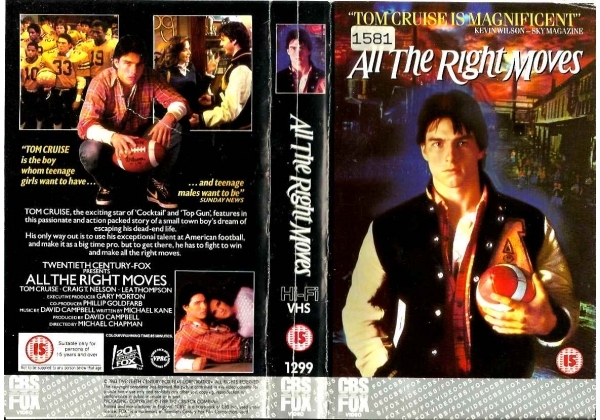 Or find "All The Right Moves" on VHS and DVD / BluRay at Amazon.